February 15, 2019 Amy gives some tips for photographing on the street in this Artsy feature. October 27, 2018 Amy’s interviewed in The Photographic Bandwidth by photographer Tim Frazier. Topics of conversation include her intense start as a photographer, New York City’s embrace of misfits, life on the streets in Bed-Stuy, Brooklyn, and more. October 11, 2018 Two images from Us are included in Brooklyn Photographs Now, a book published by Rizzoli reflecting the avant-garde spirit of the city’s hippest borough. Containing previously unpublished work by well-known and emerging contemporary artists, the book presents 250 images by more than seventy-five artists, including Mark Seliger, Jamel Shabazz, Ryan McGinley, Mathieu Bitton, and Michael Eastman, among many others. Edited by Marla Hamburg Kennedy, with essays by Anne Pasternak and Philip Lopate. 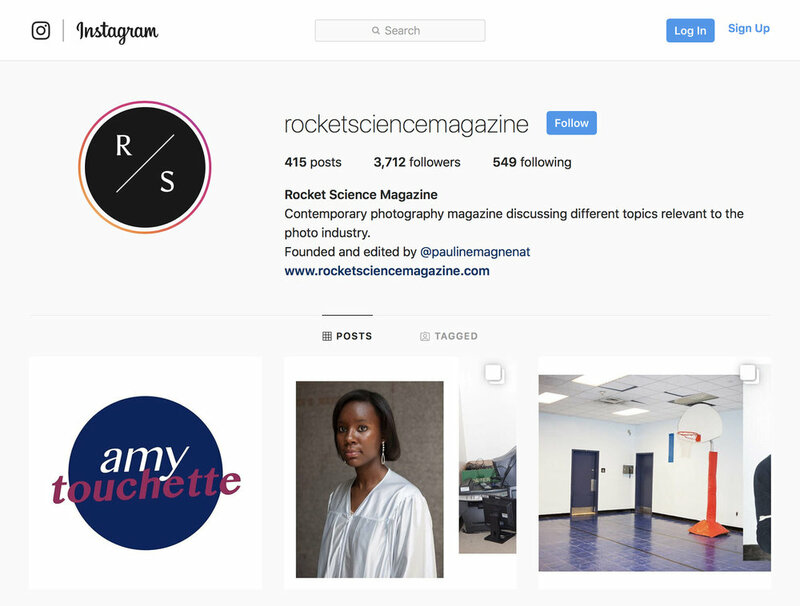 OCTOBER 4-10, 2018 Rocket Science Magazine brings together the finest and most exciting actors in contemporary photography through a set of portfolios, interviews, features, and articles. Amy shares some of her favorite images from Street Dailies, while taking over Rocket Science Magazine’s Instagram for the week. MARCH 1, 2018 LENSCRATCH is a daily journal that explores contemporary photography and offers opportunities for exposure and community. Created in 2007, Aline Smithson set a goal of writing about a different photographer each day, presenting work in a way that allows for a deeper understanding of a photographer’s intent and vision. LENSCRATCH is considered one of the 10 photography blogs you should be reading according to Source Photographic Review, Wired.com, Rangefinder and InStyle Magazine. FEBRUARY 7, 2018 "The Eye of Photography" is a digital magazine where everything about photography is published daily, highlighted, discussed and archived for professionals and amateurs alike. FEBRUARY 22, 2018 "We Heart" is an online magazine exploring the intersections between art, design, lifestyle and travel. FERUARY 14, 2018 Photo District News (PDN) features The Young Series on "Photo of the Day." FEBRUARY 11, 2018 The Daily Mail publishes a feature article about The Young Series. 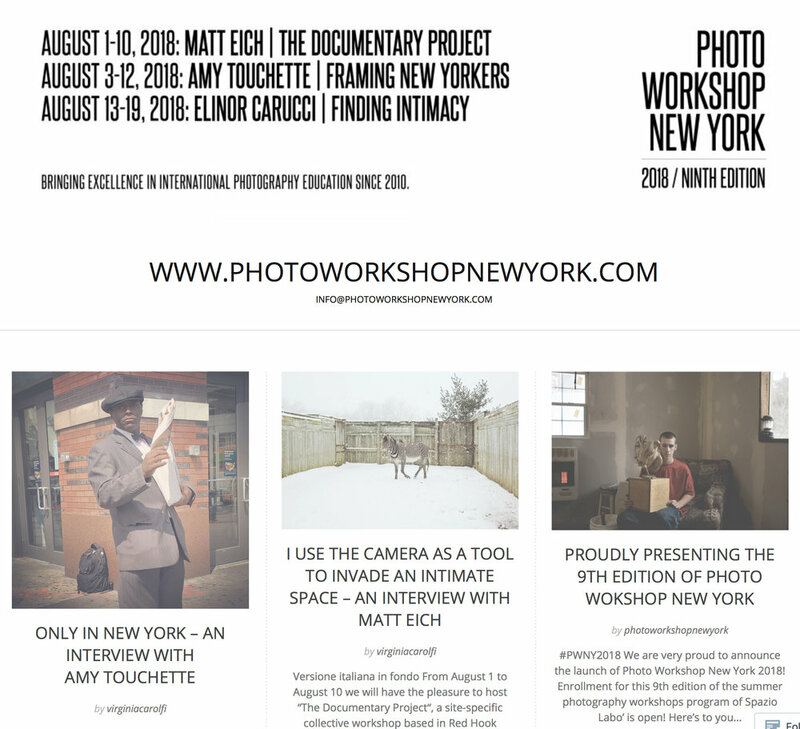 FEBRUARY 9, 2018 PHOTO WORKSHOP NEW YORK (PWNY) is an educational project organized each year in New York City, founded in 2010 by Laura De Marco and Roberto Alfano, the directors of the center of photography Spazio Labo’ in Bologna, Italy. NOVEMBER 2, 2017 The Creative Independent is a resource of emotional and practical guidance for creative people. Its goal is to educate, inspire, and grow the community of people who create or dream of creating. The Creative Independent is ad-free and published by Kickstarter, PBC. Each weekday they publish one interview by an artist—including musicians, authors, filmmakers, dancers, designers, and others. Conversations explore themes like collaboration, creative beginnings, the creative process, failure, triumph, fear and anxiety, and bouncing back. AUGUST 28, 2017 GUP Magazine (Guide to Unique Photography) is an international authoritative publication on photography, connecting its communities with the sharpest conceptual photography, the latest photo books, and compelling writings about the contemporary world of photography. 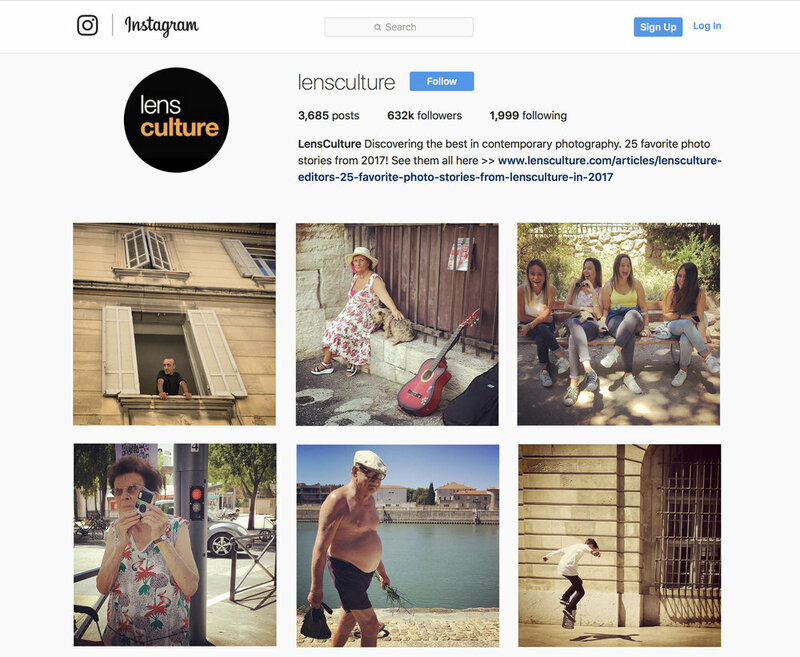 JULY 2-11, 2017 While attending Les Rencontres d'Arles, an annual photography festival in Arles, France, I took over LensCulture's Instagram, posting iPhone pictures of the strangers I encountered in the style of Street Dailies. JUNE 2017 Lens Magazine is an international publication showcasing contemporary fine art photography. Amy is interviewed in issue no. 33. SPRING 2017 "43rd Street, Midtown, Manhattan, 2015" from Street Dailies is on the cover of the eighth print annual of Painted Bride Quarterly, a literary magazine supported by Drexel University. APRIL 2017 While working as a guard at the Metropolitan Museum of Art in New York City, photographer Jason Eskenazi began to ask photographers he knew visiting the "Looking In Exhibition" about Robert Frank’s The Americans to choose their favorite image and explain why. Here, The New Yorker explains the project in greater detail. Includes contributions from Amy, as well as Mary Ellen Mark, Joel Meyerowitz, Robert Frank, Martin Parr, Josef Koudelka, John Gossage, Alec Soth and many more. NOVEMBER 18, 2016 As Diane Arbus' landmark exhibition at the Met Breuer, "In the Beginning," which features many never-before-seen images, drew to a close, photographers who knew her or were influenced by her work were asked to comment on a photograph that surprised or disappointed them. Their answers (including mine, slide 3) are compiled in this slideshow. SEPTEMBER 19, 2016 BUST magazine's Tara Wray interviews Amy for the series "Lady Shooters," which highlights women photographers. AUGUST 18, 2016 Street Dailies is featured on PDNedu's blog. The PDN family of websites—including Photoserve, Photosource and PDNedu—is an unparalleled source of information and inspiration for professional photographers, photo buyers, visual creatives, photo students and their instructors. AUGUST 14, 2016 Fstoppers is an online community aimed at educating and inspiring photographers, videographers, and creative professionals. Started in 2010 by founders Patrick Hall and Lee Morris, Fstoppers has grown into one of the top resources for photography lighting, gear reviews, business tips, behind the scenes, and industry news. AUGUST 12, 2016 The New York Times Metropolitan section features a selection from Street Dailies, as well as an article about the series. JUNE 8, 2015 In the opinion section of the New York Observer, Amy explains her passion for photographing on the streets of New York City. JUNE 20 2014 "Photographer Amy Touchette, whose work has appeared on the Pin in the form of this intensely gorgeous collaboration with The World Famous *BOB* and this 2011 series of sister/not sister portraits, has a wonderful new photo collection and essay about the rule-heavy McCarren Park Pool and the locker room where she met and covertly, quickly photographed a succession of shy, brazen, awesome teenage girls." DECEMBER 2014 PHOTO magazine highlights Street Dailies in its Tour du Monde section. PHOTO is a French magazine that focuses on artistic aspects of photography. DECEMBER 21, 2014 Reading The Pictures Originals features Street Dailies and Amy's personal editorial about making candid street photography in "Ode to Light: Making Street Photography in a Cynical Age." DECEMBER 8, 2014 "Amy Touchette's beautiful photographs prove that street photography is alive and well." DECEMBER 4, 2014 "The photographer Amy Touchette takes piercingly intimate photographs of New Yorkers. Her subjects' beauty lies in their uniqueness, she says." JUNE 22, 2014 Reading The Pictures Originals features McCarren Park Pool Changing Room and Amy's personal editorial about her experience making the series in "When Photographing Is Forbidden: Making Portraits in the McCarren Park Pool Locker Room." FEBRUARY 10, 2014 La Repubblica is an Italian newspaper focused on politics, news, economy, sports, foreign affairs, music, culture, science, and technology. FEBRUARY 5, 2014 The World Famous *BOB* and Amy converse about the making of Shoot the Arrow: A Portrait of The World Famous *BOB* in the rare book room at Strand book store in New York City. FEBRUARY 5, 2014 Shoot the Arrow book event at Strand bookstore in NYC is TimeOut magazine's critic pick. FEBRUARY 2014 Oslo-based BLIKK magazine features Shoot the Arrow in "The Girl Who Was a Dragqueen." JANUARY 2014 Rangefinder magazine recommends Shoot the Arrow in its "focus" section. JANUARY 2014 Istanbul-based Bant Mag. is a magazine that also organizes concerts, exhibitions, workshops, and other events. DECEMBER 4, 2013 "From a girl growing up on a 115-acre farm in California to a drag queen named after The Cure’s Robert Smith and known to concoct martinis in her décolletage, the photos give a bit of insight into an underground figurehead who turned to performance as a method of detangling her own identity." DECEMBER/JANUARY 2014 Editor Emily Rems lists Shoot the Arrow: A Portrait of The World Famous *BOB* as one of the season's best pop culture bets in "The Hotness." NOVEMBER 25, 2013 "The Life of a New York Burlesque Dancer Laid Bare: Candid Photographs Capture Celebrated Buxom Blonde On and Off Stage," by Sadie Whitelocks. NOVEMBER 15, 2013 PDN Photo of the Day displays photographs selected by the editors of Photo District News, a publication for photo professionals. NOVEMBER 14, 2013 The Hairpin features text by The World Famous *BOB*, subject of Shoot the Arrow, in the article "On Being Photographed: 'Female-Female Spiritutal Transsexual': The World Famous *BOB* Presents the Subject's Point of View." NOVEMBER 5, 2013 The Literate Lens is a bi-weekly blog that investigates connections between photography, art and literature, aiming to bring more depth to the cultural conversation around all three. NOVEMBER 4, 2013 The New York Photo Review reviews Shoot the Arrow exhibition at ClampArt. OCTOBER 21, 2013 Musée Magazine reviews Shoot the Arrow exhibition at ClampArt. OCTOBER 17, 2013 Slate's photography blog, Behold, features an article written by Alyssa Coppelman is a freelance photo editor based in Austin, Texas, who spent most of the aughts as assistant art director at Harper’s. JUNE 27, 2013 Alexander Norton writes a perspicacious article about The World Famous *BOB* in Paper Journal. SEPTEMBER 14-OCTOBER 18, 2012: Independent publisher Edizioni Labo's catalogue from "Uncommon Intimacy," an exhibition held in Spazio Labo', Bologna, Italy, in March 2012, is published in A Survey of Documentary Styles in Early 21st Century Photobooks, by Darius Himes and Larissa Leclair. "Uncommon Intimacy" exhibited photographs by Erica McDonald, Amy Stein, and Juliana Beasley, as well as from Shoot the Arrow. SEPTEMBER 2012 Shoot the Arrow is the cover story of Transgressor magazine's debut issue, including interviews and audio of The World Famous *BOB* and Amy's super-8 film of her performing "Finale." SEPTEMBER 2012 Italian online magazine Landscape Stories 09: Adolescence is a collection of photography, interviews, videos, and literature about adolescence. JULY 22, 2012 The New York Times Metropolitan section features a selection from New York Young, as well as an article about the series. See the slideshow. APRIL 2012 Established in 2004, SeeSaw is an online photography magazine created by Aaron Schuman that's dedicated to work that successfully captures, represents, and encourages acute observation, via the photographic medium. MAY 2011 Photographs from Shoot the Arrow are on pages 60-65. MAY 2011 Versal is a literary & arts journal based in Amsterdam, the Netherlands. SPRING 2017 “Tompkins Square Library Drawing Class” from Shoot the Arrow is on the cover of the fourth print annual of Painted Bride Quarterly, a literary magazine supported by Drexel University. 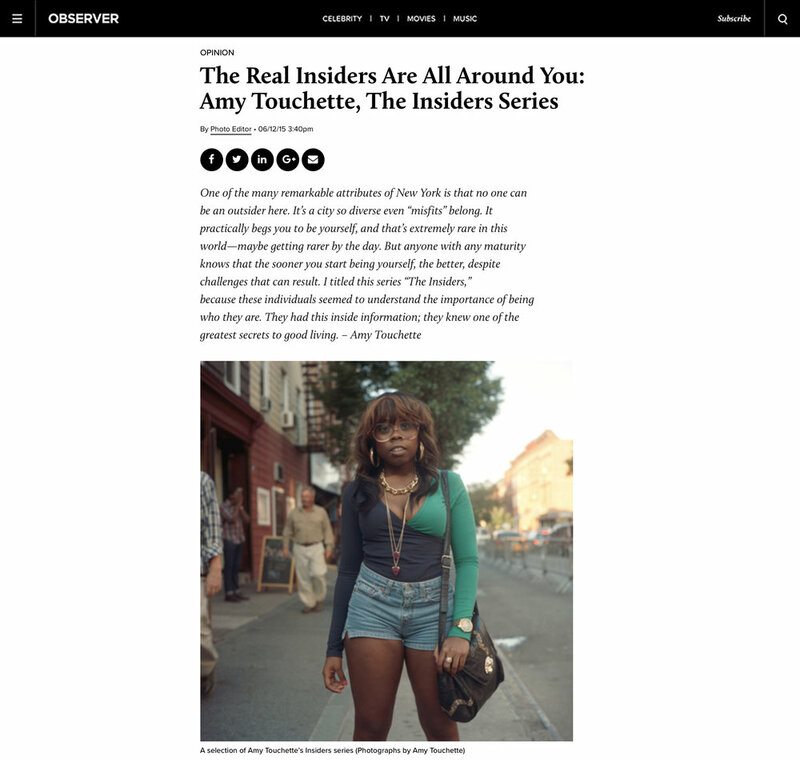 JULY 26 2012 The Insiders is featured on Booooooom.